Iceland’s Blue Lagoon spa is famous. But it’s just the tip of the country’s thermal-bathing iceberg…as I enjoyed discovering while working on our new Rick Steves Iceland guidebook. This post (part of my Iceland blog series) is a roundup of the many hot-water opportunities around Iceland. Special thanks to our co-author, Ian Watson, who taught Rick and me everything we know about Iceland’s thermal bathing culture. The volcanic island of Iceland sits atop vast reservoirs of naturally superheated water. 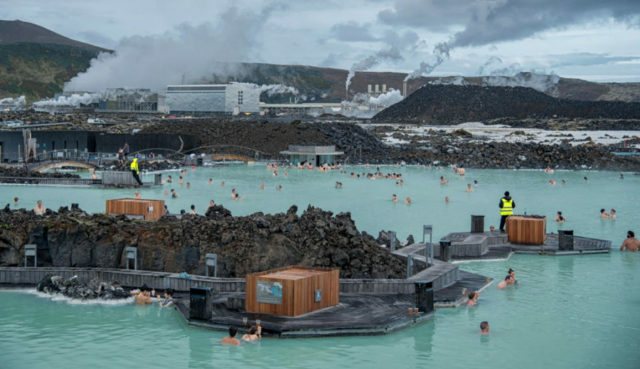 And, in a sparse land with few natural resources, the Icelanders have expertly figured out how to harness that water to create electricity, to heat their homes…and to have fun. If you’re visiting Iceland, be sure to check out its many opportunities to soak in naturally heated water, starting — but certainly not ending — with the famous Blue Lagoon. In some ways, the Blue Lagoon is the ultimate expression of Icelandic thermal bathing culture: a top-end spa with steaming, murky-blue water filling a lava-rock basin. It’s pricey…but, for many visitors, well worth it. I love the Blue Lagoon, and can’t imagine a trip to Iceland without it. That said, those who decide that the Blue Lagoon is right for them are in for a memorable experience. From the parking lot, you’ll walk up a jagged canyon to the entrance. Find your locker, get changed, head outside, lower yourself to the vast, relaxing pool…and simply float. You can paddle over to the bar to buy an overpriced microbrew or skyr smoothie. You can cruise beneath the little footbridges (where you’ll find water fountains). You can plant yourself under a thundering mini-waterfall for an aqua-massage. And you can get a sample of the slime that builds up on the walls of the lagoon — a natural exfoliant — and smear it all over your relaxed face. Once your face is all oozed up, consider this: You’re simmering in industrial waste. The Blue Lagoon got its start when a geothermal plant was built in the middle of a petrified lava flow. The water they pumped up from deep underground wasn’t pure enough to pipe into area homes. However, it was hot enough to heat other water. Once that’s done, they simply dumped vast volumes of still-pretty-hot water into the nearby rocks. Locals discovered this as a secret spot for a memorable dip. Eventually developers took note, turned it into a top-end spa…and now you’re spending a hundred bucks for the pleasure of bathing in byproduct. I tease. The Blue Lagoon experience is a memorable one — and the water is incredibly inviting, and perfectly clean and safe. (And opaque. Don’t drop anything while you’re in the lagoon, or you’ll never find it. Leave your glasses in the locker room.) 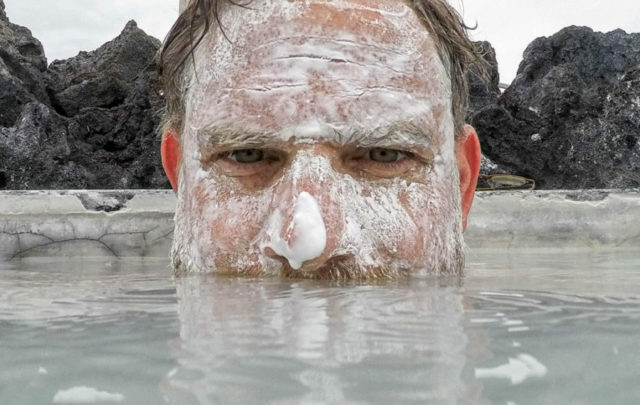 By the end of my soak at the Blue Lagoon, I was already strategizing how to fit a five-hour layover into my next European flight plan. A few practical considerations: Remember that reservations are required (www.bluelagoon.com). And notice that the Blue Lagoon is 45 minutes from downtown Reykjavík, but quite close to the international airport, Keflavík. The most efficient plan is to combine your Blue Lagoon visit with your arrival to or departure from Iceland. (All other things being equal, it makes sense to hit the lagoon on your way home, so you’re relaxed for the flight. But your flight schedule will likely dictate which option works best.) Airport-transfer companies make it very easy to splice in the Blue Lagoon, and there’s easy baggage storage right at the parking lot. 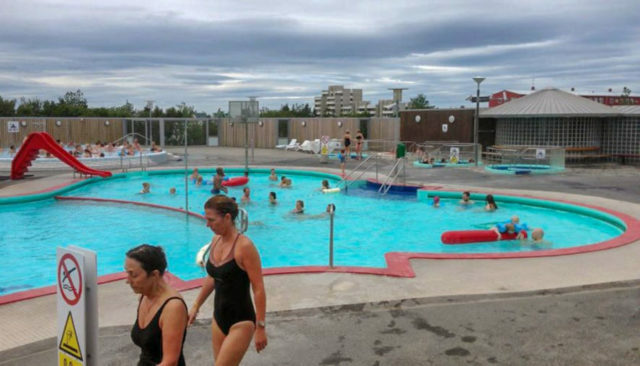 While almost every tourist in Iceland goes to the Blue Lagoon, very few of them dive into even one of the more than 120 municipal swimming pools all around the country (including about a dozen in the Reykjavík area alone). 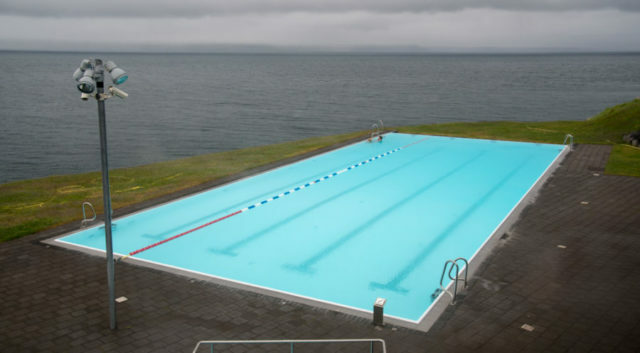 It seems that every little Icelandic community of just a few hundred people has managed to scrape together the funds to build a top-notch municipal pool (sundlaug). 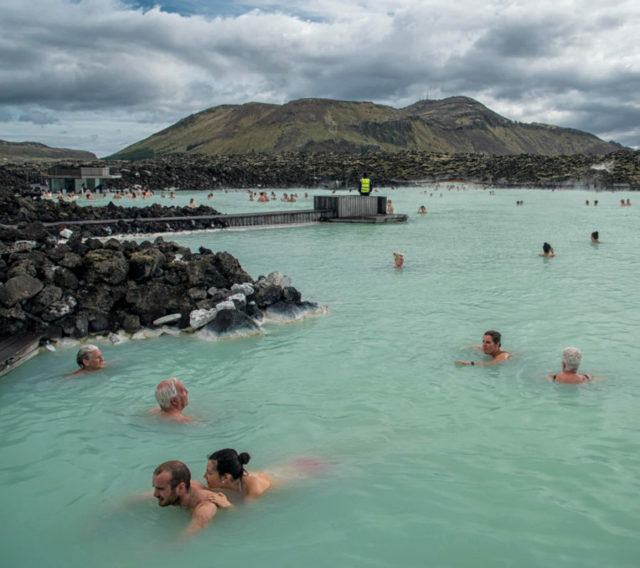 This is where Icelanders come with their families, after work and after school, to hang out in the hot water and catch up with their friends and neighbors. 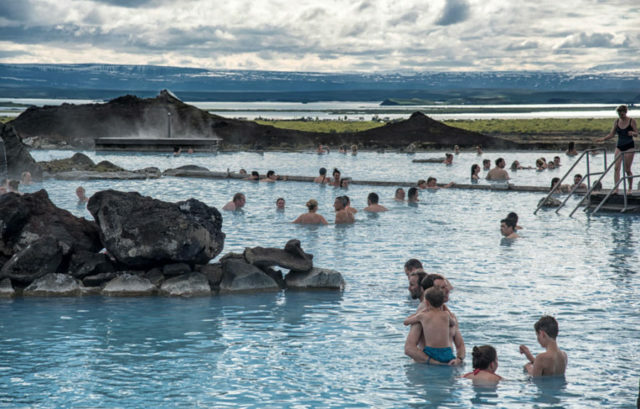 Icelandic swimming pools can range from tiny one-poolers to sprawling suburban complexes, with indoor and outdoor sections, saunas, waterslides, and full cafeterias. And most of them cost less than $10 to enter (even cheaper if you get a shareable multi-visit card). Various resources list all of your options, including www.swimminginiceland.is, www.hotpoticeland.com, or the Thermal Bliss brochure downloadable here. 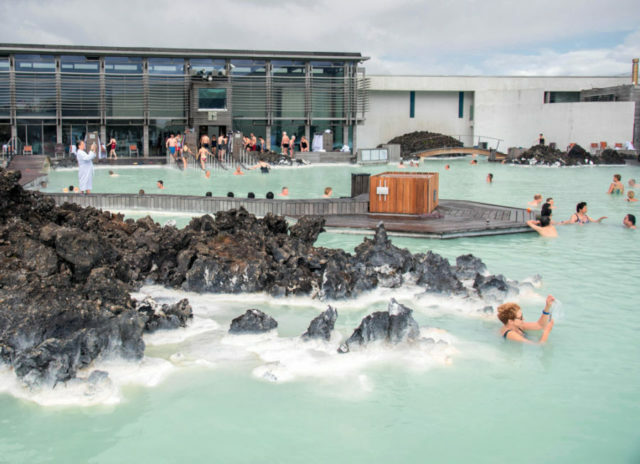 Visiting an Icelandic swimming pool comes with a very specific procedure, which we’ve explained in detail in our Rick Steves Iceland guidebook. The gist: Remove your shoes outside the locker room. Get naked and shower (yes, naked — it’s a hygiene thing, and locals might hassle timid tourists who try to shower in their swimsuits). Slip into your swimsuit, head out to the pools, and enjoy. 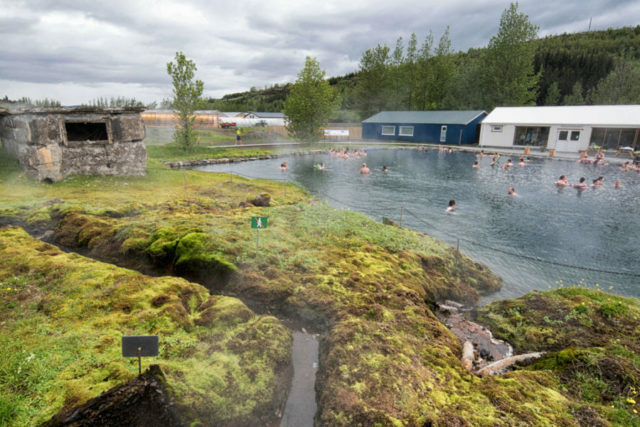 While the ambience is unmistakably “suburban swimming pool,” the water is luxuriously warm — lap pools at 85 degrees, other pools around 100 degrees — and the whole experience is quintessentially Icelandic. 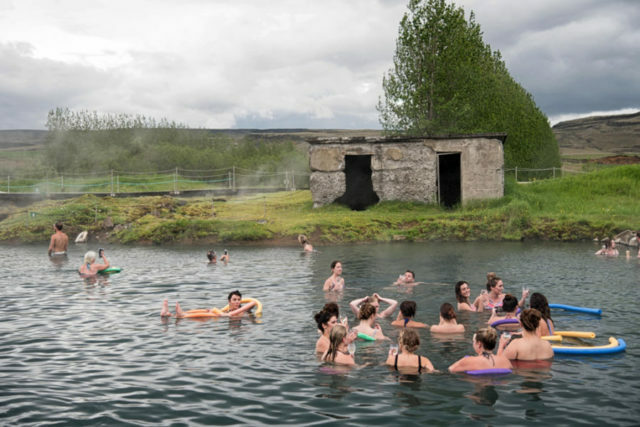 Beyond the municipal swimming pools, Iceland has several other ways to go for a soak. A variety of “premium” baths offer a more upscale, tourist-oriented experience. Two options sit about an hour from Reykjavík (Laugarvatn Fontana to the east, on the Golden Circle route; and Krauma, to the north, near Borgarnes). But my favorite premium bath in Iceland is Mývatn Nature Baths, in North Iceland (about a seven-hour drive from Reykjavík, or a two-minute detour from the Ring Road). Nestled in a rocky landscape overlooking Lake Mývatn, this spa has a Blue Lagoon ambience at about half the price. Yet another option is to go natural: bathing in the wide-open Icelandic nature. If you’re rugged and low-maintenance, you can hike to a variety of thermal hot springs. Don’t expect many services — you’ll need to haul in your suit and towel, and changing rooms and bathrooms are limited or nonexistent. One popular choice is Reykjadalur (literally “Steamy Valley”), just above the town of Hveragerði between Reykjavík and the South Coast. Here you can park your car and hike about an hour up to a warm, knee-deep stretch of river where you can lie back and soak. Be warned, though, that hiking or bathing in a geothermal landscape comes with a risk of getting burned — watch your step and stay on marked trails. It’s been a long day. From the little fjordside village of Borgarnes on the west coast, I’ve driven 150 miles on rugged, one-lane roads through Icelandic splendor and drizzle. 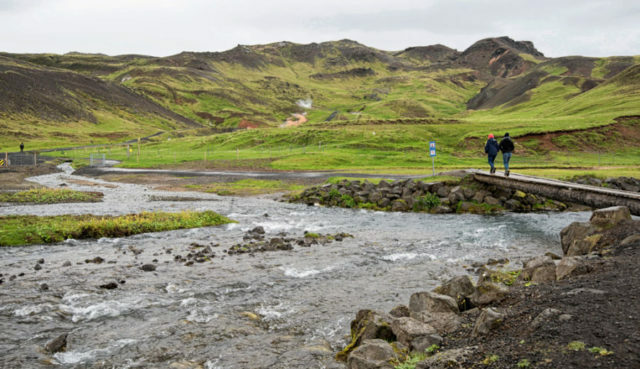 What could have been a three-hour drive stretched to about ten, with dozens of guidebook-scouting stops en route at farmhouse B&Bs, open-air folk museums, truck-stop cafeterias, climbable volcano craters, and Icelandic horse-riding ranches. Kissing frogs for a new guidebook is exhausting work. In yet another little fjordside village — Hofsós — I close down the fine little Emigration Museum and retreat through the increasing rain to my car. There I sit, my glasses fogging up, as I flip through my notes and try to rally one last time for the 45-minute drive back to my (reportedly haunted) hotel across the Skagafjörður. But then, I remember: Hofsós has a municipal pool. And, from what I’ve heard, it’s a great one. 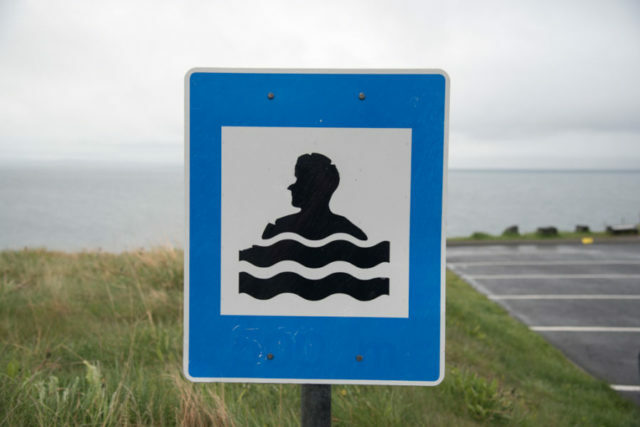 Driving through town, sure enough, I spot the blue-and-white, head-poking-above-the-waves sign that I’ve seen in every town between here and Reykjavík. It’s 6 p.m., nothing awaits me at my hotel but angry Viking ghosts and a pile of work, and it’ll be light out for another six hours at least. Might as well take a dip. Stepping into the pool’s lobby, I’m told the good news and the bad news. The good news: the pool is still open for another two hours. The bad news: the smaller hot pot is closed for maintenance. But they’ve cranked up the temperature in the main lap pool to compensate. Shrugging, I insert my credit card in the chip-and-pin machine to pay the $9 admission, stick my shoes in the cubbyholes at the entrance to the locker room, shower, and head out into the drizzle. The Hofsós pool is simple, but delightful: One big, welcoming infinity pool perched on a bluff overlooking the fjord. It’s a steamy, turquoise oasis shrouded in a gloomy landscape that sent a generation of villagers in search of a better life in Manitoba and the Dakotas. Easing myself into the hundred-degree water, my decision is instantly validated. It’s just me and the fjord. I float, feeling the stress of a long day leach out of my pores and joints. I came to Iceland to see fjords and lava flows and glaciers and geysers. What I hadn’t bargained for was that, tucked around every corner, I’d also find a pool like this one to recharge and warm up. 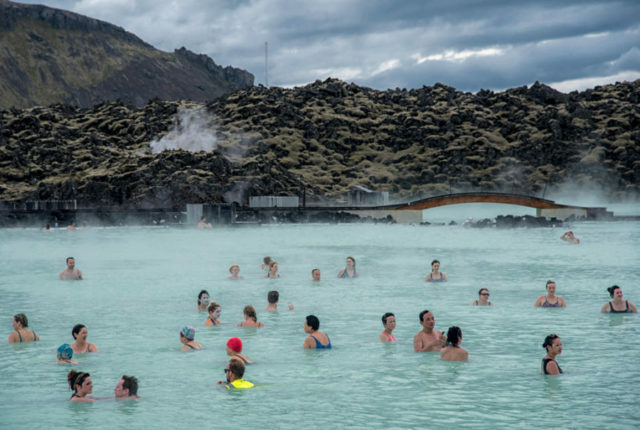 Whether you’re enjoying a basic municipal pool overlooking a misty fjord, soaking in a thermal river deep in the countryside, or splashing out with a deluxe soak in a lava-rock lagoon, make sure to take advantage of Iceland’s hot water. We did enjoy the Blue Lagoon on our visit. Due to time constraints we didn’t do a lot of exploring. Tried the golden cirlcle but that was kind of waste other than the waterfall. Even though we said wed never go back (very expensive) we have decided to give it one more try on one of our trips to Europe. Great information about all of the alternatives for thermal baths. I’ve been to Iceland and the Blue Lagoon private spa(main was being remodeled) and although expensive was an awesome adventure. I did not know about the public pools in most towns so thank you and I can’t wait to go back and follow your path. Great review! We have just returned from Iceland and can’t wait to return sometime in Spring/Summer to see all the wildflowers and the puffins! We couldn’t travel the Ring Road due to weather but we had an excellent evening watching the Northern Lights -the real reason for our trip. I’ve enjoyed following this blog, Cameron and look forward to using the new guidebook when we return.